For this Month’s MiningIR ‘Deeper Feature’ Matt Geiger of MJG Capital Fund, LP digs deep into the finances and history of a gold explorer trading at a substantial discount to working capital, and one of Canada’s most exciting new projects. If you missed our last Deeper Feature with Andrew O’Donnell (Supercharged Stocks) about the golden triangle, past & present, read it HERE. Golden Valley Mines (TSXV: GZZ) has been a partnership holding since April 2016 with an average cost basis of C$0.28. The company is a gold-focused prospect generator active primarily in Quebec and Ontario. 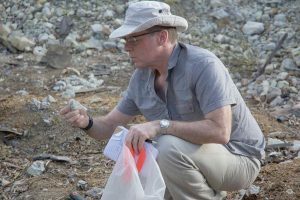 CEO Glenn Mullan is the current president of the Prospectors & Developers Association of Canada (PDAC) and an esteemed prospector who originally staked what is now the world-class Canadian Malartic Mine. GZZ owns a 44.7% stake in Abitibi Royalties (TSXV: RZZ) which has been one of the top performing gold companies over the past half-decade. The company also has multiple active option deals as well as a sizable 100%-owned property portfolio. Despite these attributes, GZZ is valued at a substantial 40% discount to the value of its cash + marketable securities. In this Deeper Feature piece, I begin by providing an overview of the company – with a particular emphasis on Glenn Mullan’s background, the GZZ share structure, the company’s lean overhead, the insider ownership positioning, and an overview of the company’s assets. We then dig deeper into Golden Valley’s 44.7% stake in Abitibi Royalties. Any investor looking to purchase GZZ must first get comfortable with the Abitibi story. Next, we discuss how Golden Valley shares offer significant upside on a sum of the parts basis. The share price would have to rise 74% from current levels before the company reaches a positive enterprise value. The bonus is that the company also offers exploration upside that is harder to quantify but is very real. We conclude with Golden Valley’s expected catalysts over the coming months, so readers can keep tabs on the company’s progress alongside me. Most significant is first production at the Malartic Mine’s Jeffrey Zone, but upcoming drill results from Golden Valley’s three option partners (Bonterra Resources, Alexandria Minerals, and Battery Minerals Resources) shouldn’t be overlooked. Golden Valley Mines is an 18-year-old company listed on the TSXV under the ticker GZZ. CEO Glenn Mullan has been with the company from day one and has a fascinating background. Glenn began prospecting as a teenager and now has 40 years of experience in the mineral exploration industry. His first big success was as CEO and founder of Canadian Royalties Inc., which discovered and developed the Nunavik nickel-copper-PGE mine in Quebec. The mine was eventually acquired in a hostile takeover by the Chinese group Jilin Jien Nickel Corp for C$192.5m in 2009. Jilin has since spent another $2b on the now producing asset. Nunavik is quite the operation with 300 employees and a full operating mill. Glenn struck gold a second time in the early 2000’s when he staked 100% of the eastern portion of the Malartic property under the banner of Golden Valley Mines. Glenn optioned the Quebec-based project to Osisko Mining for a 30% free-carried interest in 2006. Over the ensuing years, Osisko proved out a world class, multi-million ounce (>10m oz) gold project which culminated in a 2014 takeover battle ultimately won by a joint bid from Agnico Eagle and Yamana. The Canadian-Malartic Mine is now in production and is home to the largest gold mill (55,000 tpd) in Canadian history. Abitibi Royalties, of which Golden Valley Mines owns 44.7%, holds a 3% NSR royalty over a substantial portion of the Malartic land package. Despite Golden Valley’s near two-decade existence, the company has a tight share structure of 146m fully diluted shares – with no share rollbacks in the company’s history. GZZ has been successful in minimizing share dilution for a couple reasons. The first is by virtue of the company’s prospect generator business model where Golden Valley attracts other parties to “earn into” its projects and gets to keep a free carried interest in the form of either an NSR royalty, minority project-level interest, and/or equity stake. GZZ has stayed true to this business model throughout the company’s existence. The second factor contributing to this tight share structure is the company’s emphasis on minimizing overhead. This is no better demonstrated than the 2011-2014 period where NOBODY in the company received a salary. Needless to say, this type of behavior by management is far from normal in the junior mining space. In recent months, the GZZ burn has increased to C$200k per month now that markets have picked up from the 2011-2015 bear market. This stems primarily from re-instated salaries as well as claim fees for the company’s 100%-owned project portfolio. I don’t anticipate this number moving any higher. Glenn owns roughly 5% of Golden Valley Mines on a fully diluted basis. The largest individual shareholder is board member Jimmy Lee at roughly 21%. Other notable shareholders include: QC Labour Funds at 4%, Rob McEwen at 3%, and Jilin Jien at 1.5%. Most significantly, Osisko Gold Royalties (TSX: OR) has quietly accumulated a 7% position in Golden Valley with a cost basis between C$0.25-C$0.30. This is a recent development of which the market is largely unaware. It remains to be seen whether Osisko views Golden Valley as merely an attractive passive investment or whether this is the first step in a potential buy out. Starting with #1, the bulk of GZZ’s value comes its 44.7% ownership position in Abitibi Royalties. Adjusted for Abitibi’s most recent share price of C$10.00, this equity interest is worth roughly C$54m. This alone compares very favorably to Golden Valley’s fully diluted market cap of C$34m. As displayed in the graphic below, Golden Valley also has equity interests in three different juniors: 3% ownership of Sirios Resources (TSXV: SOI), 26.5% ownership of Val-d’Or Mining (TSXV: MZZ), and 17.5% ownership of International Prospect Ventures (TSXV: IZZ). On paper, the combined value of these three equity holdings totals ~C$3m. Golden Valley’s #2 category of assets is the company’s three partner funded option agreements with Bonterra Resources, Alexandria Minerals, and Battery Minerals Resources. These three deals are similar in that the respective partner is earning into what is now a 100%-owned Golden Valley project originally staked by Glenn Mullan. In the event that any or all of these partners complete the option agreement, Golden Valley then retains a 15-20% free carried interest in the project as well as a 1.5-3% net smelter royalty. The option agreement with Bonterra Resources (TSXV: BTR) was announced in March 2016 and gives Bonterra the right to earn an 85% stake in Golden Valley’s Lac Barry Prospect in exchange for C$200k in Bonterra shares (already issued) and a work commitment to spend C$2m over a three-year period at Lac Barry. Upon exercise of the option, Golden Valley retains a 15% free carried interest and a 3% NSR (with 1% subject to a C$1m buyback). The Lac Barry Prospect is located to the southwest along the projected strike extension on the West Arena Property of Bonterra’s Gladiator Gold Project, which is currently being drilled on by Bonterra. In addition, the Lac Barry Prospect is adjacent to and immediately southwest of Bonterra’s Coliseum Property. Bonterra drilled Lac Barry for the first time in the summer of 2017 and results were announced in September 2017. This program was a success and resulted in the discovery of the Temica Gold Zone. Assays from the three best drill holes are outlined in the chart below. Bonterra is planning a follow-up exploration program at Lac Barry in 2018. Further ground geophysical and geochemical programs plus mapping are ongoing. Most significantly, a follow up drill program will soon commence with assays expected by the end of the year. This drilling will focus on the Temica Zone as well as additional targets and identified trends on the property. Golden Valley’s second partner funded option agreement is with Alexandria Minerals (TSXV: AZX) at the Centremaque Property. This deal was announced in April 2017 giving Alexandria the right to earn an 80% stake in Centremaque in exchange for C$250k in Alexandria shares and a work commitment to spend C$4m over a four-year period. Upon exercise of the option, Golden Valley retains a 20% free carried interest and a 1.5% NSR (with 0.5% subject to a C$1m buyback). In the spring of 2018, Alexandria reported that a total of 7 holes for 3,348m had been drilled at Centremaque. Hole CAX-18-001 hit 0.65m @ 14.5 g/t Au at 285m depth and hole CAX-18-003 hit 1.8m @ 36.62 g/t Au at 337m depth; assays from the remaining holes are pending. It is expected that Alexandria will initiate another drill program at Centremaque by year end 2018. However, given the recent boardroom turmoil at Alexandria, this is not a certainty. Golden Valley’s third partner funded option agreement is with Australian private co Battery Mineral Resources (BMR) at the Island 27 Cobalt Project. This deal, which was announced in June 2017, gives BMR the right to earn an 80% stake in Island 27 in exchange for C$500k in cash and a work commitment to spend C$5m over a four-year period. Upon exercise of the option, Golden Valley retains a 20% free carried interest and a 1% NSR. Island 27 had limited historical work before acquisition by Golden Valley, who then drilled hole GIS-08-04 (first drilling ever on property) hitting an impressive 4m @ 4.18% Co, 12.1 g/t Ag, 0.38% Ni, and 0.098 g/t Au at a depth of 110m. Battery Minerals recently commenced its first drill program at Island 27. Assays are expected by year end and it is anticipated that at least 2000 meters will be drilled. It is difficult to put a fair value on what amounts to three free lottery tickets. We’ll value these at C$2.5m, which is the total synthetic revenue expected to be generated by these three partners in 2018. “Synthetic revenue” is a somewhat obscure concept relevant to the prospect generator niche. It can be thought of as the money that other parties will spend on your behalf over the next 12 months. Golden Valley’s #3 category of assets is the 100%-owned property portfolio in the Abitibi Greenstone Belt. This is Glenn Mullan’s backyard and the location of much of his past work. Golden Valley’s head office is in Val-d’Or, the center of the region’s exploration activity and only 20 kilometers from Malartic. The vast majority of this portfolio was staked by Glenn himself. A breakdown of the property portfolio by target commodity and location can be seen below. Due to its disciplined adherence to the prospect generator business model, it is extremely unlikely that Golden Valley would drill any of these properties themselves. It is however likely that Glenn is in talks with multiple potential partners regarding additional option agreements. It’s not unreasonable to expect one or two new agreements to be announced by year end. Due to the possibility of further synthetic revenue being generated through new partner-funded option deals, we’ll value this project portfolio at C$1m. To conclude this section, it’s worth mentioning that Golden Valley currently sits on a C$1.2m cash position and no debt according to the company’s most recent investor presentation. Glenn expects this cash position to increase over the coming quarters due to management fees + incoming option agreement payments. The company hasn’t conducted a private placement since February 2016 and won’t need to do so for the foreseeable future. In stark contrast to the vast majority of juniors, there is no worry about further share dilution here. This section is dedicated to Abitibi Royalties (RZZ), of which Golden Valley Mines owns 44.7%. Abitibi Royalties was initially spun out and listed as a public company in 2011. The flagship royalty in its portfolio is a 3% NSR on the eastern portion of the Canadian Malartic mine (owned and operated by Agnico Eagle and Yamana Gold), which includes the Jeffrey Zone and the Barnat Extension where production activities are expected to commence in late 2018. The NSR also includes the exciting Odyssey North discovery and other portions of the Odyssey Project, as well as portions of the East Malartic property, which was a historical gold producer. Golden Valley’s CEO Glenn Mullan originally staked the claims covered by this 3% NSR. Glenn serves as Chairman on the Abitibi Board and owns 3.5% of the company (in addition to his indirect stake through Golden Valley). The second key player is Abitibi CEO Ian Ball, who took the reigns from Glenn in mid 2014. Ian owns 2% of the company himself and for a couple years now has used all of his after-tax salary for share purchases. Directors and management own a healthy 9.7% as a group. Other key shareholders include Rob McEwen at 12%, Quebec Labour Funds at 5%, and most recently CDPQ at just under 5%. Including Golden Valley’s 44.7% stake, these parties alone control over 70% of Abitibi Royalties shares outstanding. To Ian Ball’s credit, he has done a tremendous job driving shareholder value in the four years since he joined the company as CEO. The chart below demonstrates this sterling performance relative to Abitibi’s larger competitors in the royalty space. Note that the Abitibi Royalties share price is up 2,729% over the past 4.5 years. Is this insane outperformance set to continue? Probably not. Reversion to the mean is a very real phenomenon. However, at the current C$120m market cap, shares of RZZ are far from overvalued. The company holds no debt and roughly C$45m in cash + marketable securities. This brings the enterprise value down to ~C$75m. Now compare this EV to the company’s projected 2019 cashflow of between C$4-4.5m. (We are using 2019 cashflow as it incorporates the additional royalty revenue expected from the soon to be producing Jeffrey Zone, which is scheduled for first production in Q4 of this year.) This results in a P/CF multiple of between 17x and 19x. While this P/CF multiple is indeed higher than most of RZZ’s junior royalty peers, this is not without good reason. Keep in mind that the Canadian Malartic Mine is not a small or marginal operation by any stretch of the imagination. This is a mine that supports the largest gold mill ever built in Canada! There is no question that even the biggest royalty companies covet exposure to the Malartic. This quite possibly explains why Osisko Gold Royalties recently initiated its 7% position in Golden Valley Mines, which is effectively a 3.5% indirect interest in Abitibi Royalties. It is also worth noting that RZZ holds an additional 22 non-producing royalties outside of the Canadian Malartic. The most notable of these include: (1) a suite of 1-2% NSR’s bordering Goldcorp’s Red Lake Mine and Pure Gold’s Madsen Mine, (2) a 2% NSR next to New Gold’s Rainy River Mine, and (3) a 3% NSR surrounding Eldorado Gold’s producing Efemcukuru Mine in Turkey. These provide free upside beyond the numbers discussed above. Since the company’s AGM in June, Abitibi Royalties has been busy. The company announced the new $5m investment from the Quebec pension fund CDPQ in late June, which was followed by a barrage of news releases in early July announcing the acquisition of four new royalties contiguous and proximate to its core holdings in the Malartic. I commend the company for refraining from making these royalty purchases when gold was above $1300 and instead waiting until the recent Au price weakness before making its move. The biggest risk to the Abitibi share price relates to expected first production from the Malartic’s Jeffrey Zone. This is scheduled for Q4 2018. The market seems to be pricing in that cash flow from Jeffrey will commence on time. Any substantial delay would certainly be a negative for the share price. Golden Valley Mines has just under 148m shares fully diluted. This results in a fully diluted market capitalization of roughly C$34m at current share prices. First, you have the 44.7% ownership percentage in Abitibi Royalties. At current market prices, this equity position alone is worth C$54m. Next comes Golden Valley’s equity interests in SOI, MZZ, and IZZ. On paper, the combined value of these interests equals C$3m. Then comes Golden Valley’s current cash position of roughly C$1.2m. Pausing here, we can see that a valuation of C$58m can be easily justified between GZZ’s cash position and equity interests. This is 74% above Golden Valley’s current fully diluted market cap. This is a good time to reference Ben Graham, who in Security Analysis emphasizes that “net working capital” should be viewed as the minimum fair value placed on a given company. The three active partner funded option agreements with Bonterra Resources, Alexandria Minerals, and Battery Minerals Resources collectively providing exploration leverage and up to C$2.5m in 2018 exploration funding, most of which will be spent on drilling gold and cobalt targets. The sliding 2.5-4% NSR on Sirios’s Cheechoo Gold Project which has now seen over C$20m in project expenditures. The 100%-owned project portfolio staked by Quebec prospecting legend Glenn Mullan. Given Glenn’s track record of multiple world class discoveries, one could make an argument that the 100%-owned project portfolio alone should be worth C$10m. In a better market, it almost certainly would be. However, out of conservatism, I’m going to assume that the three partner funded option agreements, the Cheechoo 2.5-4% NSR, and the 100%-owned project portfolio COMBINED are worth a mere C$5m in additional value. This results in a fair value of C$63m for all of Golden Valley. The GZZ share price would have to rise 83% from current levels to achieve this valuation on a fully diluted basis. That’s substantial upside for a company that’s so easy to value. And any exploration upside comes for free. It bears repeating that, unlike the vast majority of junior miners, further equity dilution should not be an issue for Golden Valley. CEO Glenn Mullan has assured me that the cash position is expected to rise over the coming quarters due to management fees + option payments. If the company does find itself low on cash in the coming years for whatever reason, it is far more likely that we’ll see Glenn sell 1-2% of Golden Valley’s stake in Abitibi Royalties to raise funds (versus conducting a dilutive private placement). One possible criticism of the above valuation is that I’m not pricing in a liquidity discount for Golden Valley’s 44.7% stake in Abitibi Royalties. After all, Abitibi is traded thinly with only ~C$20k in volume per day. However, knowing how much Glenn covets exposure to the Malartic operations, I can say definitively that Abitibi Royalties will be acquired outright well before Glenn ever considers liquidating the position. He’s going to hold RZZ to the end and I’m ok with that. Given that Golden Valley’s 44.7% stake in Abitibi Royalties comprises the bulk of the company’s value, the number one risk facing GZZ shareholders is weakness in the RZZ share price. As mentioned earlier, any investor looking to purchase GZZ must first be comfortable with the RZZ story. A second risk is the possibility of further share dilution by Golden Valley. While Glenn expects the company’s cash position to increase over the coming quarters due to management fees + option payments, this cashflow could dry up when we next find ourselves in a mining bear market. In conclusion, I’ve provided below the catalysts that can be expected over the coming months and years. I’ve also included some milestones pertaining to the Canadian Malartic Mine, given the relevance to GZZ shareholders. Positive drill results from Bonterra, Battery Minerals, Alexandria, Sirios, and Val-d’Or Mining all have the potential to drive new investor interest in GZZ. The same stands for any new partner-funded option agreements inked by Glenn Mullan. Additionally, Pilbara-focused International Prospect Ventures (IZZ), of which GZZ owns 17.5% and Rob McEwen owns 15%, is expected to provide a corporate update in the coming months. This is yet another “iron in the fire” for Golden Valley that could act as a positive share price catalyst. All that said, given the company’s outsized equity interest in Abitibi Royalties, I think it is clear that the most important near-term milestone is successful commencement of production at the Jeffrey Zone in Q4 2018. Jeffrey is expected to increase Abitibi’s cashflow by roughly 30% and could lead to another re-rating of the RZZ share price. This of course would be an indirect positive for GZZ shareholders. Golden Valley shares at C$0.24 offer healthy 83% upside with minimal downside risk. This is an opportunity for investors to align themselves with an accomplished CEO in a company trading at a substantial discount to its cash + marketable securities. The opportunity stems from a distinct lack of market exposure for both GZZ and RZZ. Given the handful of catalysts expected over the coming months and the recent buying from Osisko Gold Royalties, I don’t anticipate the Golden Valley share price to remain at this level for long. Edited for publication by Liam Hardy – 28th August 2018 – MiningIR were not paid for this article. Mining Investor Resource Media Ltd. host a variety of articles from a range of sources. Our content, while interesting, should not be considered as formal financial advice. Always seek professional guidance, do your own DD and consult a selection of sources before investing. MiningIR host a variety of articles from a range of sources, our content, while interesting, should not be considered as formal financial advice. Always seek professional guidance and consult a range of sources before investing.